By now, you are probably wondering the same thing. Were these people waiting in line for the latest iPad? Or the newest version of the Apple iPhone? Perhaps they were waiting their turn to see a famous celebrity inside? Saint Patrick’s Cathedral in downtown New York City where thousands queued up to receive ashes on Ash Wednesday. No. They were waiting for neither something to buy nor someone to see. These New Yorkers; old and young, rich and poor, churched and perhaps a number of un-churched, were waiting in line, to enter St. Patrick’s Cathedral, so that a priest could place ashes on their forehead, in the form of a cross as a reminder of a very sobering reality that we are all dust and to dust we shall return. The last place one would expect to find such large numbers of people participating in this most Catholic ritual is in the United States, I thought to myself. 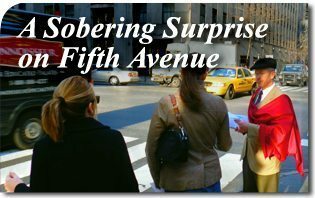 It was even more surprising for me, as an American, to see it in the Big Apple and on Fifth Avenue which is known for everything but such an attachment to, what some would call, an archaic religious custom. The biggest surprise came from a number of foreigners passing by. A family from Catholic Ireland was amazed at the lines and asked me what was going on. They were surprised at the willingness of Americans to display a visible sign of their faith, but they did not even think about joining the New Yorkers. They were anxious to get to their destination, The Lego Store down the street. The most shocking comment came from a couple from Austria who approached me with a look of utter shock. “What is the line for?” they asked. “It’s Ash Wednesday,” I responded, “these people are waiting in line to receive ashes.” Since the two were from a Catholic country, I figured this was a sufficient amount of information to satisfy their curiosity. To my surprise the man look at me a bit stupefied. Thousands lined up to receive the cross of ashes as a reminder of their mortality, then return to work with the visible sign of their Catholic Faith. I then began to give, what amounted to, a brief sidewalk catechism class. “Ash Wednesday is the first day of Lent, which lasts for forty days until Easter,” I explained. “Well, we still do it here in America,” I proudly responded as more New Yorkers brushed by us to enter the queue. It had, by then, stretched nearly to the end of the block. America is often looked upon – even by some within her own borders – as the most liberal, Godless nation on earth. While there is much to criticize about America, there is another reality which often goes overlooked. On Ash Wednesday 2012, I got a glimpse of that reality and in all honesty I was as “mugged by reality” as the Austrian couple. They might no longer believe in such meaningful rituals, but thousands of New Yorkers showed they still do. They waited in line, had a cross of ashes marked on their foreheads as a reminder of their mortality, then returned to their place of work with a visible mark of their Catholic faith. All of this in the most recognizable city in America. It truly was another example of a paradox found, Only in America. 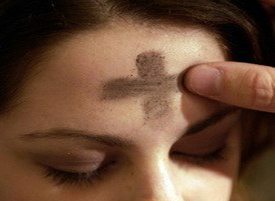 This entry was posted in Catholic Perspective and tagged America, Ash Wednesday, ashes, Catholic, Catholic Church, dust, faith, Fifth Avenue, forehead, Lent, mortal, nation, New York City, Saint Patrick's, sign of the cross by Norman Fulkerson. Bookmark the permalink.